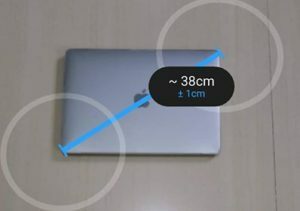 One of the interesting app I’ve came across recently is Google’s AR Measure App. This app allows you to use your phone camera to pick two points in the real world and get the distance between them. You can use either imperial or metric units in measurement. In addition, you can also save photos for later measurements. For approximating the height of a cabinet or the length of the table, this app can come in handy. And from experience, it’s quite accurate. I tried to measure my Macbook Pro and I was only 1 centimeter off. Although I have already tried the app in measuring short lengths, I would like to try measuring long ones. I think this can be very useful in teaching trigonometry and trigonometry. For example, we can make students solve for trigonometry problems and then use the app to check if their answer is correct. That is, of course, assuming that the app is accurate at measuring long distances. Google AR Measure is available for free in Google Play for Android phones that support Google’s ARCore platform. There is an interesting competition though. Apple has the same app which has the same name.